In the 2016 scholarship season, Manatee Community Foundation awarded 47 scholarships totaling $156,248 from sixteen scholarship funds established by donors who believe in the power of education. Students include college bound seniors pursuing degrees in finance, accounting, health science, education, biology and engineering; graduate and Medical students; and adult learners who are returning to school for careers in welding, law enforcement, culinary, nursing, and automotive fields. A volunteer committee chaired by Manatee Community Foundation board member Rebecca Neal reviews applications in a competitive process and advises recipients based on pre-determined criteria for each scholarship fund. 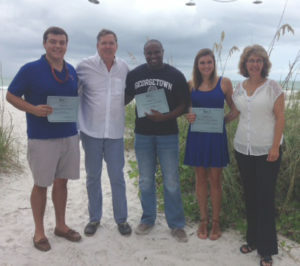 The State College of Florida, University of Florida, Florida State University, Manatee Technical College, Georgetown, Florida Gulf Coast University, Southern Methodist University, USF Morsani College of Medicine, and University of South Florida Sarasota-Manatee are among the institutions scholarship students will attend. Students receiving scholarships from Manatee Community Foundation are: Serenna Jones, Joseph L. Murray, Chelsea M. Perez, Zadda M. Bazzy, Karissa L. Sammons, Kristyn LaRoux, Darryl Corder, Lentz Laurent, Francisco Moreno, Thahn Tran, ShelbyGail M. Manson, Alexia Yavalar, Joseph A. Cucci, Thaddeus Fair, Kaitlyn Conrad, KaCee Perkins, Jacqueline St. John, Christopher Conway, Caroline A. Imiolek, Emily K. Waikem, Sierra Blashock, Hale Inocente, Kristyn Conrad, Kailey Fischer, Maria P. Vargas, Nelly V. Wilson, Ludonir Sebastiany, Nicholas Castner, Savannah McGee, Kaitlyn Johnson, William P. Ehrenfeld, Jacob M. Kargauer, Logan LaFave, Courtney Rapp, Logan Altman, Colby Wheeler, Madeline Kaklis, Tia Borso. Molly Knight, Brittany Hewett, Tyler Godwin, Amanda Graves, Tyler Parkinson, Aaron Cobb, Ian MacDonald, Gabriel Chawi, and Hannah Moise. To learn about creating a scholarship fund, contact Manatee Community Foundation at (941) 747-7765.